I had hoped to have a few more potent examples of the flags issue before I wrote this but alas, time and laziness are my only excuses. Its the time of year when some sections of the community feel the need to demonstrate their allegiance to Britain and to remember past victories. Earlier this year, I was in Amsterdam on the day they commemorate their liberation from Nazi Germany and heard some of the young people remark that it was time to move on. Time to let go. Yet in Northern Ireland some members of the Unionist community hang onto the memories of the past like it was their fathers victory and it only yesterday. These celebrations of Protestant Tradition stem from 1690. What confuses me is that I am from this community but have never understood this need for celebrating the past and imposing traditional marches upon communities who do not want them. How does my history improve with age if I have to force my message onto others? Its unneccesary, its an anachronism.......Dave Wiggins has an interesting blog on this issue too. I long for the day when July is just yet another wet month in our Summer. 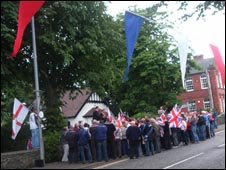 The BBC has a report here on a protest last night by members of the Orange Order in Larne about the local council's refusal to erect bunting up in the town for the July Marches. The council are not permitted to do so as it breaches equality legislation.